After beating Alabama, the #4 Tigers (9-1) had a clear path to the SEC Championship Game. Beat Ole Miss on the round and Arkansas at home. Even if Bama won its remaining game against Auburn November 19, LSU would end in a tie with the Tide at 7-1 in the conference. The Tigers would win the tiebreaker by virtue of their triumph at Tuscaloosa November 12. 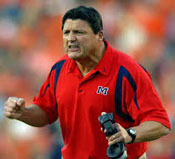 The Rebels were enduring a miserable season under new coach Ed Orgeron. 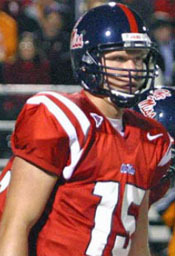 Ole Miss had fired David Cutcliffe after he went 4-7 the season after Eli Manning's graduation after the 2003 season. 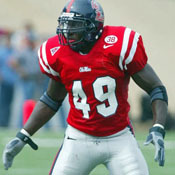 The '05 Rebels won only three of their first nine games - Memphis 10-6, The Citadel 26-6, and Kentucky 13-7. 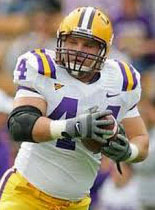 The good news for Orgeron was the return of MLB Patrick Willis after multiple injuries. His presence made the Rebs strong against the run. Mississippi had problems through the air, allowing five passing TDs the past two weeks. On the other side of the ball, the Rebels had major problems. Ethan Flatt would start his third game after taking over for Michael Spurlock at QB. But a signal-caller needs a strong running game, and that's what his mates couldn't supply even before TB Mico McSwain got hurt. Flatt's best bet was to throw the ball quickly to capable receivers Mike Espy, Mario Hill, and TE Robert Lane, who started his college career as a QB at LSU. The temperature was 41 degrees at the ESPN2-mandated game time of 6:45, by which time Alabama had lost to Auburn 28-18. Q1: Receiving the football when Ole Miss deferred, the Tigers made one first down at the 45 Dwayne Bowe's 32nd catch of the season. But after JaMarcus Russell's 3rd down pass to Skyler Green missed the 1st down by 2y, Chris Jackson, with a 42y average for the season, punted dead on the 14. Ethan Flatt, starting his third game under C for the Rebels, quickly connected with WR Mike Espy, who eluded Chevis Jackson for a 1st down at the 38. But a block in the back on the next play set the home team back 15. 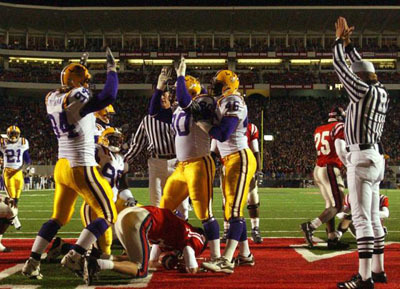 On 3rd down, Flatt fell on his backside as he pulled out from C in a play reminiscent of the Tigers' last visit to Oxford in '03 when Eli Manning did that on a crucial play late in LSU's 17-14 victory that paved the way for the Tigers to win the SEC and BCS Championships. Starting from their 42, the Bengals again picked up a 1st down on Joseph Addai's 10y run. Addai had carried the ball only eight times the previous three games because of an ankle injury. But two short runs and an incompletion brought Jackson back out for a punt to the 11. Oher would become famous as the subject of the 2009 movie The Blind Side. Tigers celebrate safety over QB Ethan Flatt. Green returned the free kick 23y to the Rebel 48. But the Tigers could not take advantage of the field position thanks to a holding penalty. Three possessions, three punts. Another three and out for Ole Miss, including Flatt dropping the snap to negate another play, necessitated a punt that Green returned 17y to put the Tigers back in business at the Reb 47. Russell rolled right and tossed to WR Buster Davis, who made a rolling catch at the 15. The Tigers added to their SEC-best red zone scoring average (27-of-30 for 90%). Three runs by Justin Vincent gained 10 for a 1st-and-goal. A 1y gain by Justin ended the period. Espy was smothered at the 16 on the return but that was the Rebs' best starting position so far. Flatt threw three straight passes, with two complete for a loss of 5y. The Rebs' bad field position (the 14 this time) and futility continued, as Flatt dropped the ball again on 2nd down. When a 3rd down completion fell short, the punt went out on the Ole Miss 44. But on 2nd down, JaMarcus threw long down the middle to Davis at the goal line. The ball bounced off his hands to S Charles Clark in the EZ. With the touchback giving the Rebels their best position at the 20, Claude Wroten burst through and sacked Flatt for a loss of 7. A completion gained back some of the loss, but LSU blew up the screen on 3rd down, and the QB threw the ball into the ground as the crowd booed. The punt finally went into LSU territory, bouncing to the 46. Stung by the interception on the last possession and sensing that the defensive front was lagging, O-coordinator Jimbo Fisher called for four straight runs by Vincent. He roared through big holes to the Ole Miss 44, then the 29. But on 2nd-and-5, the Rebs stripped the ball from Justin. Russell fell on the loose pigskin but couldn't corral it. Ole Miss recovered at the 35. After a good run and an offside penalty produced a 1st down, the Rebels finally crossed midfield to the LSU 47. With the crowd imploring them to go for it on 4th and 4, Ole Miss called timeout and decided to go for it. Flatt hit Espy in front of Jackson to move the chains to the 40 with 50 seconds left. But Jesse Daniels picked off the next pass at the 18, and LSU ran out the clock. The INT was LSU's first takeaway in eleven quarters. The Rebels gained a paltry 36y the first 30 minutes. Bo Pelini's defense continued to dominate after the break. Q3: Ole Miss tried again to run back a kickoff but got only as far as the 13. On 1st down, DT Kyle Williams pushed his blocker into Kendrick as he received the handoff for a loss of 4. But a 3rd down interference call on S LaRon Landry provided a 1st down at the 26. Flatt got flattened after throwing the ball and had to leave. Micheal Spurlock completed his first pass for 7y, but the Rebs couldn't get the remaining 3 and had to punt again. Coach Orgeron explained after the game why he took Flatt out. A couple of our linemen were getting knocked back into him, and he was getting shook up. He took a couple of hard knocks that way. Bowe played sparingly the rest of the game after missing his second pass of the evening. Dwayne's streak of consecutive games with at least one TD reception ended at seven. The Rebs' comedy of errors continued. First, a block in the back made the home team start from the 8 before a false start moved the pigskin to the 4. The inevitable punt reached the 42. LSU's tremendous special teams play continued as Espy was smothered at the 13. On the first snap, LB Cameron Vaughn roared through and pulled Spurlock down by the shoulder pad at the 2. After the backup QB hit TE Robert Lane to regain the penalty yardage, the Rebels converted their first 3rd down of the evening after nine failures on a pass to Mario Hill to the 33. But the euphoria didn't last long as a heavy blitz up the middle caused Micheal to throw the ball hurriedly over the receiver right into the hands of DB Jonathan Zenon at the 48. He ran down the sideline to the 15. After a 3y pass to TE David Jones, Russell ran out of the pocked to the 3. Addai then plunged right to the goal line. But on 2nd down, he hit a stonewall at LT and lost a half-yard to the 1. Guess what? Ole Miss couldn't run the kick back to the 20. From the 16 against many LSU second stringers, Spurlock ran out of the pocket to the 28. But three incompletions brought out overworked punter Rob Park. The only question was whether the Rebels would avoid a shutout. Or whether they could start a drive outside their 20. The return fell 3y short. After an end-around gained 9y, the Tiger back-ups stuffed two runs and forced a punt. After one first down, LSU had to punt, Patrick Fisher booting to the 14. The onside kick went right to Jacob Hester, who returned to the Ole Miss 43. From there, Hester and Carey ran repeatedly to the 25 to end the game. The Tigers outgained the Rebels 381-175, with almost half (86) of the 175 coming on the scoring drive against LSU's second string D.
Ole Miss gained 7y on 22 rushing attempts (since sacks count against rushing totals in the NCAA). Russell completed 13 of 22 for 142y. Addai led the rushers with 70y on 14 carries. Vincent gained 54 on the same number of carries. The victory tied Miles with Bernie Moore for the best 10-game start for a first-year coach in school history. Bernie did it in 1935. The loss was the Rebels' worst in Oxford in 56 years. Miles: I felt like we came into this game to get a win. Now we get to move forward and focus on Arkansas and winning the SEC West. We played a great game. Our offense, defense, and special teams complemented each other. On his QB: JaMarcus has put together several quality games in a row. He is putting the ball where the receivers can catch it. He has learned how to throw the ball away and when to pull it down and scramble. ... I knew it would take some time to get the defense where it needs to be. But I think we are in a good position right now. Cameron Vaughn: We did what we had to do tonight. Our defense and our offense played great. We have some guys out there on defense that our opponents should be afraid of, and it is an honor to be out there with them. Addai: My ankle feels a whole lot better. I made a couple mistakes, but everything went pretty good. I feel like our offense left some points on the field in the first half, but once we got in a rhythm and established ourselves in the second half, we played well. Russell: We played a great game tonight. We left some points on the field in the first half, but we came out in the second half and did what we do best. Orgeron: Give LSU credit. That is an excellent football team, a well-coached football team,. very talented. They were physical, they were fast, they knew what they were doing. He admitted that injured TB McSwain wouldn't have made much difference. Mico has made a lot out of nothing this year, actually. I think he might have been able to pop a couple of runs. But we are not gong to be able to have an offense until we get better on the line of scrimmage. We were not very good on the line of scrimmage tonight. We can figure out what they're doing. We've just go to block the guys. ... We've got to get bigger, stronger, and faster. Obviously, when you play a team like that, I believe that's the eam we've got to play every year to win the SEC West. They're a lot further along than we are. We have a ways to go to catch up with them. Willis: We knew coming into the ballgame it would be a tough ballgame, but we didn't figure we'd get handled like this. I mean, LSU's a good team, and we didn't come to play the way we should against a good team. ... You can't give up big plays. That's been part of our success on defense this year, not giving up big plays for touchdowns. We did today. He praised LSU's balanced attack. They can run the ball. They can pass the ball. It's tough when you've got a balanced team like they have to run the ball the way they can and then play-action pass. They've got good receivers, too. They just throw it up and let them go get it. Flatt on his woes under C. A lot of that was due to their defensive line push. We tried to switch centers. It just wasn't working for us. They've got a great defensive line. Some plays are going to be like that. ... That's the best defensive line I've played this year. They've got speed, a lot of speed that we really haven't seen that much of.